Seeing in the New Year is popular with caravanners! Caravanning and motorhoming can definitely be for all seasons, and with the recent milder winters it seems more and more caravanners are heading off in their ‘van over the festive season. 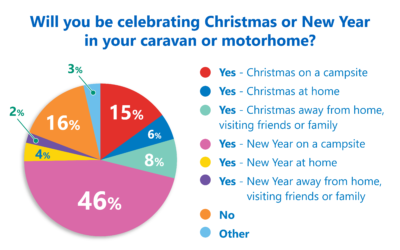 In December last year, we asked how many of our readers would be celebrating in their caravan or motorhome over the festive period – or using it at home for extra space or to visit friends or relatives..? Our community poll attracted 179 votes and we were surprised to see that almost half said they’d be celebrating the New Year on a campsite – although many campsites do host rallies or parties for the New Year. Christmas on a campsite was not as popular, but still racked up 15 per cent of the votes. And eight per cent said they would be using their caravan or motorhome to visit family or friends over the festive period. 6% said they’d be using their caravans or motorhomes at Christmas whilst at home – perhaps for storage, or maybe for guests to use as accommodation. Only 16 per cent of voters said they wouldn’t be celebrating in their ‘van at all. It was great to hear about the places some of you visited over Christmas and the New Year period. Jay Punshon has stayed at Acklington in Northumberland for the last six years and said he’s never had a bad year yet! Paul Morgan not only celebrated the New Year – but it was his birthday too! He extended a warm invite to his fellow campers to join him for cake and a drink at Camping Cardon Touring Park in Looe, Cornwall. It was a group affair for John MacBride. He celebrated the New Year with seven other caravans at a friends house. Others headed further afield across the seas, with Debi Hardie taking their motorhome to the car park at Disneyland Paris for three days then onto a campsite on the River Seine. Thanks to everyone who commented, voted, and shared their stories. Feel free to let us know where you spent Christmas or New Year in the comments box below and don’t forget to vote in this month’s poll.